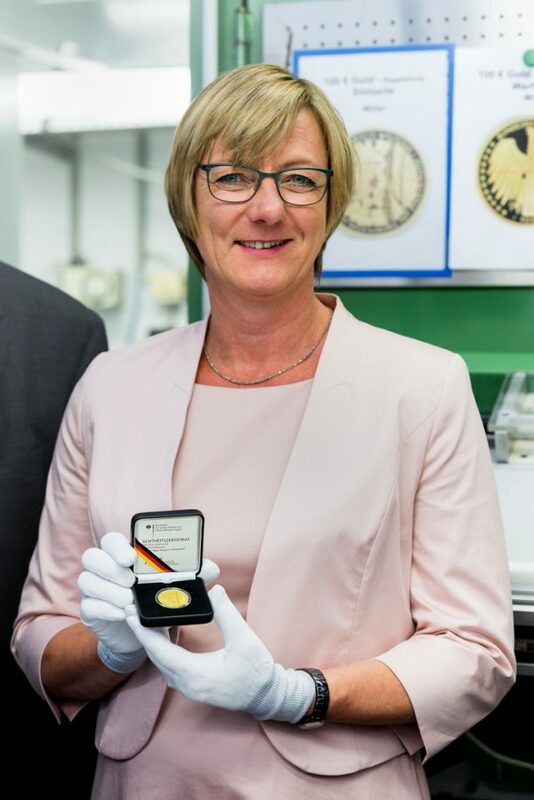 Exactly ten years after the historic city of Regensburg with Stadtamhof was included in the World Heritage list, Baden-Wuerttemberg’s Finance Minister Edith Sitzmann minted the first 100 euro gold coin featuring the historic city of Regensburg as motif on Wednesday (13 July 2016). The coin is part of a series of gold coins, on which UNESCO World Heritage sites located in Germany are pictured. 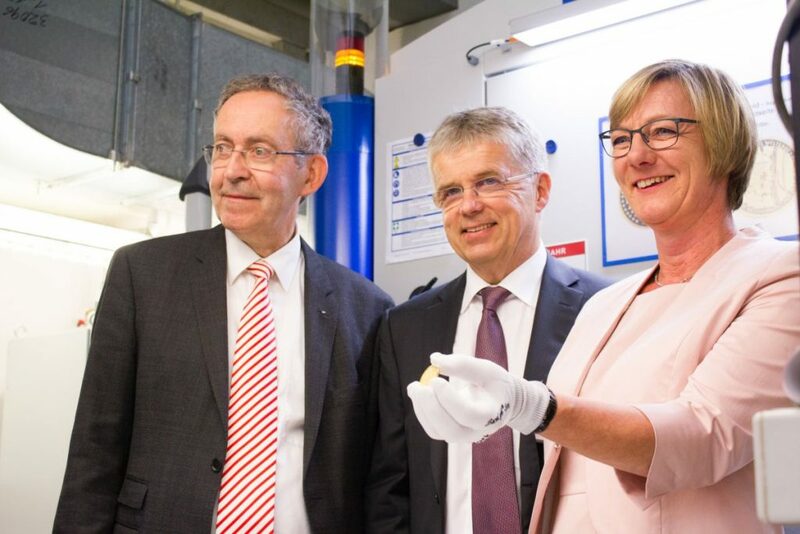 “I am particularly pleased to execute the first strike of this coin as I was born and raised in Regensburg myself”, said the Minister at the Stuttgart-Bad Cannstatt mint. “The State Mints of Baden-Wuerttemberg are just the right place for minting these coins: They are connected to the city of Regensburg by their medieval history.” The ensemble of the historic city of Regensburg with Stadtamhof dates back to the Middle Ages; as does the minting privilege of Baden and Wuerttemberg. The Margraves of Baden had the right to mint coins more than 650 years ago; Stuttgart started minting just a few years later. Dr Peter Huber, Head of the State Mint of Baden-Wuerttemberg, announced that the 100 euro gold coin will be released from October 2016. It is available for purchase from the official German Sales Agency for Collector’s Coins (www.deutsche-sammlermuenzen.de). The total mintage will be 150,000. “40 percent of the mintage will be produced in Baden-Wuerttemberg – in Stuttgart and Karlsruhe”, explains Huber. The coin’s motif was designed by Friedrich Brenner from Diedorf near Augsburg. The artist took part in the first strike ceremony at Stuttgart. The jury which had selected the design had praised in particular the combination of modernity with the history of Regensburg dating back 2000 years.